Natriumbicarbonaat ondersteunt een gezonde functie van de nieren. De nieren regelen de pH (zuur en base niveau's) van het bloed en regelen indirect de pH van de lichaamsweefsels. Als het water zuur is (waarde kleiner dan 6) kan de pH gecorrigeerd worden tot 7.2-7.5 door natriumbicarbonaat toe te voegen. Als het water basisch is (waarde meer dan 8,2) kan de pH-waarde verlaagd worden tot de genoemde waarde door enkele druppels azijn toe te voegen. Sodium bicarbonate is an all natural substance, because the raw material is rock salt. By a particular process (electrolysis) occurs sodium carbonate. Eventually, sodium bicarbonate is formed due to carbon dioxide (CO2) by passing a solution of sodium carbonate. From a number of names mentioned is the application to manage all down a bit. Sodium bicarbonate is used inter alia as a leavening agent (baking powder biscuits, crackers), acidity regulator, stabilizer and in the medical community as a remedy for excess stomach acid. The operation as a leavening agent is based on the fact that, when heated (over 50 degrees Celsius), carbon dioxide (CO2) is released. This gives the carbon dioxide gas rising effect. Also, carbon dioxide gas is released when an acid is present (at least 20 degrees Celsius). Baking soda can also add very small amounts during the fermentation process of your Waterkefir (you can also use celtic sea salt above). You can also use baking soda to brush your teeth, wash your hair or body, and wash your clothes. The function of the kidneys is to remove wastes and purify the blood. They keep the amount of fluid in the body constant. Another function of the kidneys is the formation of hormones which are important for the blood pressure, the calcium content in the bones and the production of red blood cells. Another important function of the kidneys is to maintain a good acid and base balance (pH value). If the kidneys, and lungs can not properly process the acids present by a too high supply is calcium from the bones in order to neutralize the excess. This is an emergency measure by the body during long-term acidification leads to osteoporosis. There are many diseases which are associated with a too high acidity in our body. Among other rheumatism, lumbago, osteoporosis, infertility, cancer, depression, depression, insomnia, fibromyalgia, chronic fatigue and more. An acid-base imbalance also affects the immune system so that as a result of a weakened immune system, such as chronic infections arise sinusitis, bronchitis, candidiasis, urinary tract infections (with kidney damage), viral infections such as Epstein Barr virus, and toxoplasmosis. Proper treatment of these conditions would have to begin with the restoration of the acid-base balance. By adjusting the diet often leads to recovery after a few months. Normally, the body tissues require 2-5 years in order to achieve a perfect balance. Sodium bicarbonate supports a healthy function of the kidneys. The kidneys adjust the pH (acid and base levels) of the blood and regulate, indirectly, the pH of the body tissues. If the water is acid (value smaller than 6), the pH can be corrected to 7.2-7.5 by adding sodium bicarbonate. When the water is alkaline (value more than 8.2), the pH-value will be reduced to the above-mentioned value can be done by adding a few drops of vinegar. By the accumulation of toxins the blood will go sour too. To this end, the doctor will often prescribe sodium bicarbonate in the form of capsules that creates the pharmacist. 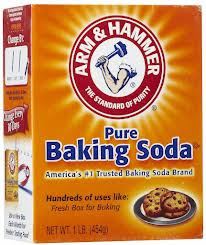 A daily dose of baking soda (sodium bicarbonate) inhibits deterioration kidneys by 65%. A daily dose of sodium bicarbonate slows the decrease of the kidney function in people with chronic kidney disease. This is reported in a study in the Journal of the American Society of Nephrology (JASN). This cheap and simple strategy also improves the nutritional status of the patient and has the potential for a substantial improvement in the quality of life. After daily use of sodium bicarbonate, the decline was reduced by kidney patients for values ​​that are normal for that age group. Dissolve a half teaspoon of sodium bicarbonate in a glass of (hot) water. For the dosage your sanity. Overdose example, mark a sensitive stomach or the tendency to diarrhea (which is my personal experience and that can be for anyone else: so try simply out). You can use baking soda as the best "cure". Then reduce the dose and not to apply daily. quickly neutralized. Lactic acid is neutralized quickly, making anaerobic efforts be sustained longer. Exercise capacity increases. Too much lactic acid in the blood blocks an effort. Sodium per gram of 0.274 grams of sodium. 22.5 grams of sodium bicarbonate containing 6.2 grams of sodium, approximately equal to 9.6 grams of salt. Well above average (too high) daily intake of a Dutchman. Sodium bicarbonate caused in 50% of the users diarrhea. The often observed stomach / intestinal disorders: nausea, gas, pressure in the abdomen, abdominal pain and diarrhea are partly caused by formation of carbon dioxide. The acid / base balance in the body is momentarily disrupted. At high doses it can cause excessive lowering of the acidity of the blood (metabolic alkalosis). Sustained muscle cramps and cardiac arrhythmias may result. Do not combine with large amounts of calcium (milk, calcium salts in tablets, etc.). Long-term lowering of the acidity may lead to phosphate stones in the urinary tract. Based on the considerations mentioned so far seems to stem a logical solution to the cancer problem in the world of fungi, which currently do not exist except useful means, in my opinion, sodium bicarbonate. The means to mold that are now on the market, are in fact not suitable to penetrate in the masses (perhaps with the exception of the first infusions of azole antifungals or of amphotericin B via parenteral administration), because these have been developed only to works on a layered level of the epithelial type. so they can not influence large myceliumaggregaten masked for the most part by the fibrous tissue which she tries to tame. Moreover, fungi able to quickly mutate their own genetic structure. After an initial phase of sensitivity to antifungal agents they may codify this within a short time and without further metabolize harmful influence of to suffer; paradoxically, they can even take advantage of its high toxic effect with respect to the organism. This occurs, for example, is carried out in the invasive carcinoma of the prostate with pelvic stiffness, wherein a treatment with antifungal drugs, which, especially in the initial stage of administration, it is very effective on symptomatologically plane, but its effectiveness loses more and more in the course of time. Sodium bicarbonate contrast, has a very high spreadability and does not have the structural complexity that can easily codify fungi. The long retains the equity of penetration into the masses, and particularly due to the speed at which it dissolves so that they are not able to adapt so that they can protect it. When a treatment with bicarbonate must therefore be immediately started with high doses, on a constant manner, in cycles, and without interruption, with a devastating effect which from start to finish without a break should take place for at least 7 to 8 days prior to a first cycle. It should be kept in mind that a mass of 2 to 4 centimeters begins to consistently smaller from the third to fourth day and collapses from the fourth to fifth day. Normally, the maximum dosage which in a single session may be used around 500 cc of sodium bicarbonate 5%, whereby the dose can be increased by 20% or lowered depending on the thickness of the subject to be treated and in the presence of multiple foci over which a larger quantity of salts to be distributed.